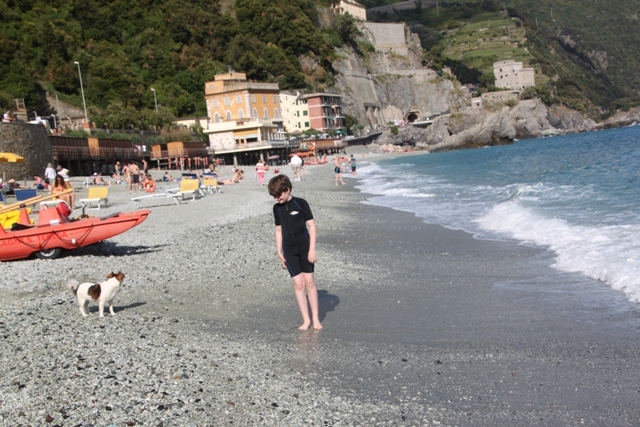 Son stressed we should shun the coastal path from Vernazza to Monterosso and take the train. Another hike would be a hike too far he reasoned and then proceeded to make a serious case for some beach time. We didn’t argue. 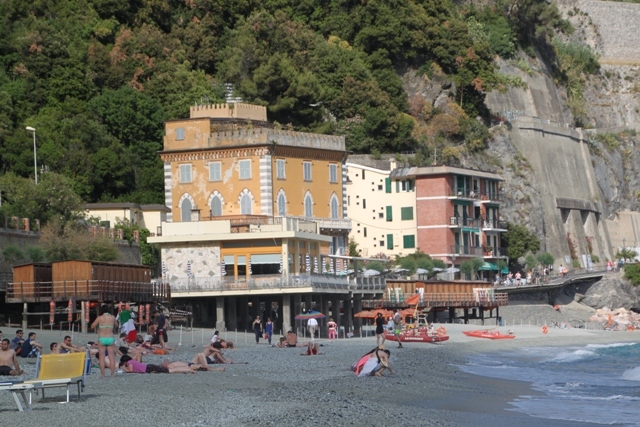 Train was boarded, we arrived in Monterosso and emerged in the conveniently located station right in the centre of the town. 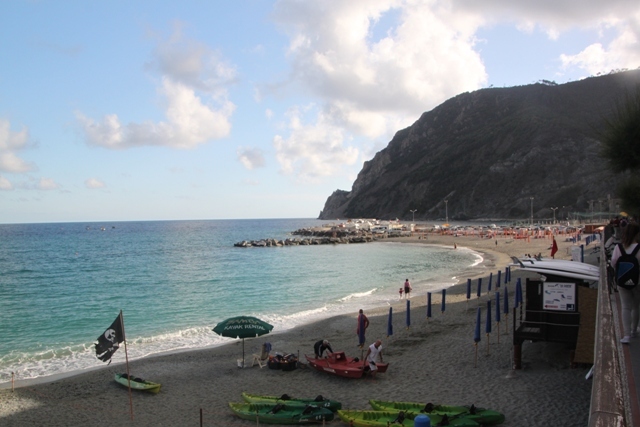 Monterosso is the first and most northern town of the Cinque Terre – just one train hop from Levanto so handy for us too at the end of a long day. It is bigger than the rest, has a handful of hotels (not that evident elsewhere) and is the only one with what might be called a beach. That is where we were headed. Son stripped into his swimming gear and hit the waves with a vengeance. A new canine friend added to the excitement and much fun was had by all. We lounged on the beach and took in the views. I had read beforehand this was the least charming and most touristy of the Cinque Terre. Touristy is a word I would use to describe them all, this one is no more or less so than the rest. To say it is less charming, not sure I agree with that either. Views like this from the beach – definitely not lacking in charm or beauty. 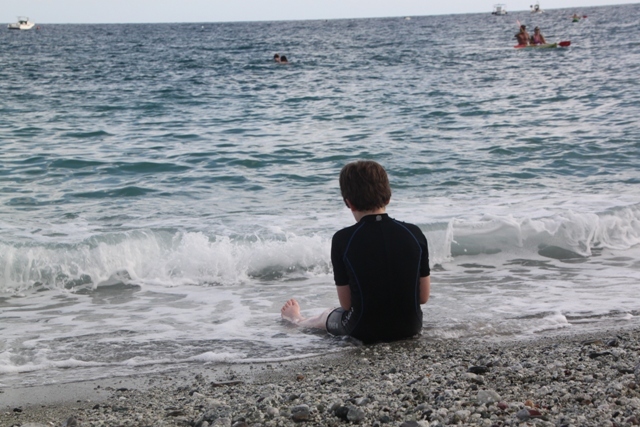 We spent ages on the beach, Son had a great time and for that reason I would say this is probably the best suited Cinque Terre town for families. The old town has lots of steep streets, we admired from afar but stuck to the new part – the beach was here and it was mainly flat. There was a great vibe along the seafront, lots of young people hanging out and no end of nice beach front restaurants. Son had developed a ever increasing desire for pizza, pizza establishments here were proving difficult to locate. Eventually with the help of a friendly local we found one, just a street or two back from the seafront. What a find – La Baraccia – if you are ever in the area I highly recommend it. Reasonably priced, great atmosphere and the most delicious food. 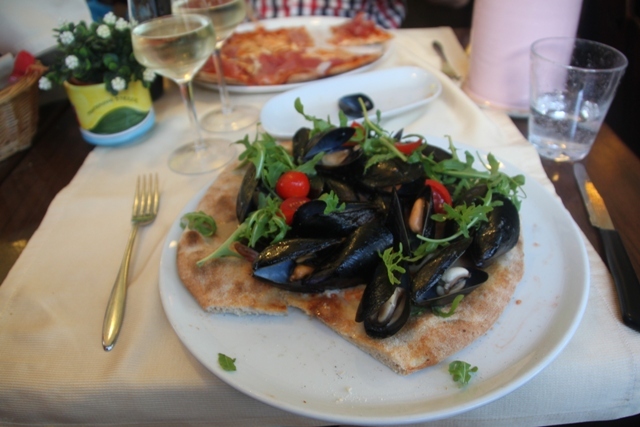 My seafood and rocket pizza was probably one of the more unusual pizzas I’ve consumed, probably also one of the most tasty. The restaurant flung in a few extras too – aperitif, amuse bouche and limoncello at the end. The extras always do it for me. With full stomachs and aching legs we wearily made our way to the train – good thing that station didn’t involve any hill climbing. Just the way to end a perfect day in the Cinque Terre. 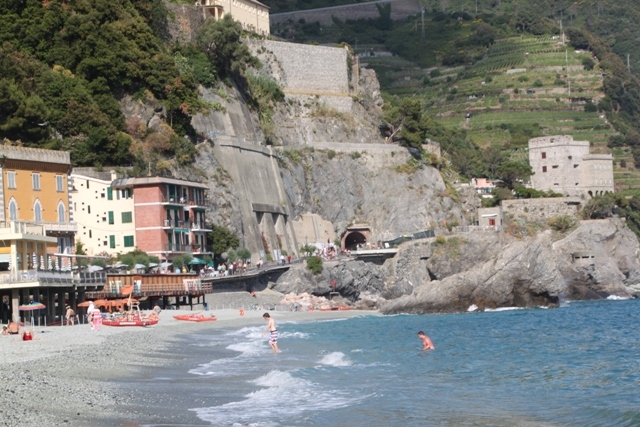 Reading your posts on Cinque Terre, I am wishing I could’ve spent more time there. How many days would you recommend? We had two nights and three full days there – this seemed to work really well for us, plenty of time to explore all of the villages, hike a little bit and relax a little bit too! Great pictures again! Thanks for the insights of your inspiring journey! Thanks for reading again Erika!! Have a lovely weekend. He definitely did – a friend for life, our son wanted to take the dog home!! Have a great weekend. Yet another amazing collection of photos and words here. I’m really thinking that a visit to Italy is in order when in Europe on our way home. Thanks for the share. Thank you! This is such a special area – would definitely recommend if you do manage a stop in Italy. Not sure if it was really Italian but it was definitely delicious! Have a great weekend. I’ve eaten at La Baraccia as well! I had an amazing pizza covered in tomato slices. I studied in Italy for a semester and can safely say it was one of my top five pizzas! Mine didn’t look like it was going to taste so good! It was fantastic, like you one of my top pizzas ever. Seems like a perfect day trip with beach, dog, and great view! It was for sure – the dog was the icing on the cake for our son!! Z always loves when she meets a doggy friend on the beach! It’s pretty common for there to be beach dogs here and she loves it! 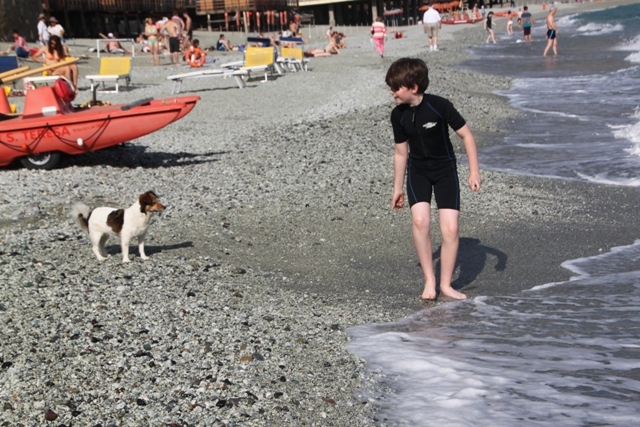 Our son would absolutely love it there – beaches with dogs is his idea of heaven! He really wants a dog of his own, but travelling makes that a bit tricky so when there is one to play with, especially on a beach he would stay for hours. We loved all of them Rosemary – a lot of things I read sort of lumped them all into one, we thought each little place had its own character and something different to offer and were so glad we spent time in each. Enjoy your weekend too! 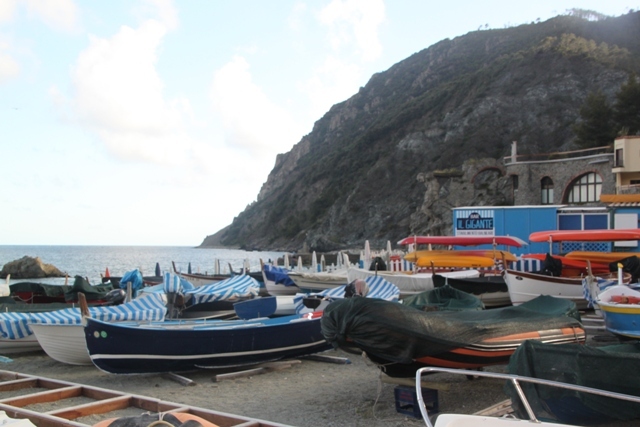 Yes that was my impression too Joy from reading other travel guides the Cinque Terre is talked about as if it’s one place – am so glad you have done a mini guide for each one! Wow – now that’s a pizza you don’t see every day. I wouldn’t know where to start! I bet it was all very fresh, though, judging from the location. Not your usual pizza topping for sure, I was more than dubious when it appeared – but like all foodstuffs in Italy it was superb! Loving, loving, loving that pizza!!!! So did I Diana – it was the best ever!! Didn’t expect to see a beach in Cinque Terre, but you’re pictures don’t lie 🙂 The pizza gave me a serious craving for rocket. Haven’t been able to find any in Mexico, so it’s been a while! That pizza was so good – the rocket was superb. Know what you mean though, when you can’t have something you seem to start craving it so much. It is probably not the best beach in the world – no golden sand etc. but it is a beach!! This looks like a beautiful place for a break. The bay and the vibrant buildings are so pretty. Think this is another place to add to my growing list! It is just gorgeous Sara – definitely merits a top spot on that list! So much to see and do and everywhere is stunning. It was a good call from him – I think although the adults didn’t quite realise, we were all ready for beach time!